Opal Lauretta Claybourn (recorded in the family Bible as Etta Opal) was born on 27 May 1895 at Kinmundy, Illinois as the tenth child of Reuben and Mary Ann Claybourn. She attended school in Kinmundy, the Field (now Hall), Franklin and the Township High School in Mt. Vernon. She was considered pretty with blonde curls in childhood, light brown curls in maturity, blue to deep violet eyes set a bit closely with low brows, fine features, and in her younger years petite. Opal entertained people with readings, both dramatic and comic, and she loved to sketch. Before her marriage she worked as a telephone operator. She was light hearted and loved to laugh, sing, and dance. She had an excellent alto voice and could sing harmony to anything without reference to music. 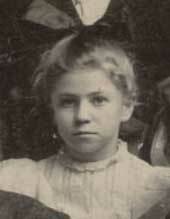 Opal married on 19 January 1913 to Herbert E. Brown, a very distant relative. [Herbert Brown was born on 16 October 1893 and hailed from the area of Texico in Jefferson County, Illinois. He was a great-great-grandson of Sally Claybourn Brown, the son of James Theodore Brown (1867-1933), a son of James A. Brown (1832-1901), who was a son of William Josiah Brown (1808-1865).] She had many of her mother’s stern religious attitudes (as well as her mother’s fast temper). She was a member of the Park Avenue Baptist Church, although as a child she was a Methodist, and was active in Sunday School, the “Ladies Aid,” and sang in the choir and in a church quartette. She loved her family. Everyone had a special verse, and her’s was “She hath done what she could.” She did. Opal’s last years were shadowed with the hardships of the Great Depression and with failing health. Despite the declining health, her death came with shocking suddenness from a ruptured appendix on 25 July 1941 in Mt. Vernon, Illinois. Herbert would re-marry three years later on 29 May 1944 to Janet Rector. Herbert and Janet had no children and, almost five years later, Herbert died on 29 March 1949. Opal and Herbert are both buried at Oakwood Cemetery in Mt. Vernon, Illinois. Rose Marian Brown was born on 23 October 1913 in Mt. Vernon, Illinois. She married Harold L. Williams on 21 December 1935. [Harold Williams was born on 26 March 1911 in Mt. Vernon, Illinois.] They had no children. Harold was a Vice-President of Griggs-Cooper (a big wholesale grocery and liquor company) of St. Paul, Minnesota. Rose was a significant collaborator in the initial compilation of the family’s genealogy. Harold died on 17 December 1981 in St. Paul, Minnesota. Rose died on 1 November 1982. They are buried together in Oakwood Cemetery in Jefferson County, Illinois. James Claybourn Brown was born on 1 August 1915 in Mt. Vernon, Illinois. He married Martha Ruth Bayne on 19 June 1937. [Martha Bayne was born on 2 August 1917 in Mt. Vernon, Jefferson County, Illinois.] They had two children, listed below. Martha died on 20 November 1983 and James died on 13 March 1987, both in Mt. Vernon. They are buried together there in East Salem Cemetery. extraordinaire, and “hostess with the mostess.” Marian died on 31 July 2011 in Fountain Hills, Maricopa County, Arizona. Marty Nichols was born a twin on 3 October 1966. Tracy Nichols was born a twin on 3 October 1966. James Steven Brown was born on 19 October 1955 in Mt. Vernon, Illinois. He married Lisa Ann Lowry. Betty Helen Brown was born on 5 March 1928 in Mt. Vernon, Illinois. She married Edward Eugene Bolerjack (“known as “Eugene”) on 9 March 1946. [Edward Bolerjack was born on 3 October 1925 in Mt. Vernon, Illinois.] They had four children, listed below. For many years Eugene operated a grocery store in Mount Vernon named Bolerjack’s that advertised its fresh meat and fish. He was elected to the school board more than once and the store sponsored local sports teams. Terry Eugene Bolerjack was born on 27 August 1947 in East St. Louis, Illinois. He married Jeanie C. Marlow and had a son, Ted E. Bolerjack, born in July 1966. Terry became a certified flight instructor. Jeanie opened Bolerjack’s Market in 2013 that sells antique-type decorative items. Thomas Bruce Bolerjack was born on 25 September 1952 in Mt. Vernon, Illinois. He married Leona Ellen Berry on 30 September 1982 in Jefferson County, Illinois, and together they had a daughter. Christine Elizabeth Bolerjack was born on 20 July 1978. She obtained a BSA degree in 2000 and an MSA degree in 2001 from Southern Illinois University Edwardsville. She worked as a financial/cost accountant with Continental Tire. Christine married in June 2006 to a man with the surname of Webb and resided in Mt. Vernon, Illinois. Julie Beth Bolerjack Chapman was born on 11 June 1961 in Mt. Vernon, Illinois. She won awards for her musical talent while in school and married a man with the surname of Chapman. They lived in Saint Charles, Illinois, and had a daughter named Katherine Chapman. Robert Scott Bolerjack was born on 13 April 1966. He studied computer science at Southern Illinois University in Carbondale and lived in Mount Vernon, Illinois. Robert Alan Brown (“Bob”) was born on 20 July 1930 in Mt. Vernon, Illinois. He was a 1948 graduate of Mt. Vernon High School. He served in the US Navy from 1948-1949 and was also in the Air Force ROTC. Thereafter Bob graduated from the University of Minnesota with a BBA and married his wife, Norma Jean Falz, on 16 June 1953. [Norma Falz was born on 17 July 1931.] He completed Harvard University’s PMD program in 1971. Bob died on 22 October 2013 at the age of 83 in Boiling Springs, Pennsylvania at the Carlisle Regional Medical Center. He is buried in the Second Presbyterian Church Cemetery in Cumberland County, Pennsylvania. Carla Diane Brown was born on 3 October 1958 in Des Moines, Iowa. She married Timothy A. Stutenroth and they lived in Dillsburg, Pennsylvania. Carla and Tim had two daughters, Catherine and Shannon Stutenroth. Todd Alan Brown was born on 12 December 1960 in Des Moines, Iowa. He married a woman named Susan and they lived in Cape May, New Jersey. Scott Edwin Brown was born on 13 December 1961 in Bethune, Pas de Calais, France. He married a woman named Sherry and they lived in Chandler, Arizona. David Andrew Brown was born on 25 July 1963. He lived in Carlisle, Pennsylvania.